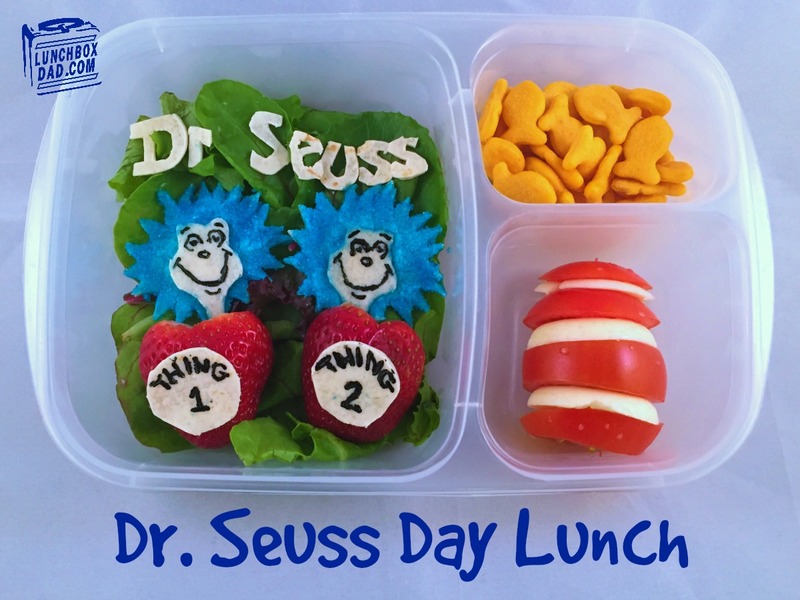 Lunchbox Dad: Dr. Seuss Day Thing 1 & Thing 2 Lunch! 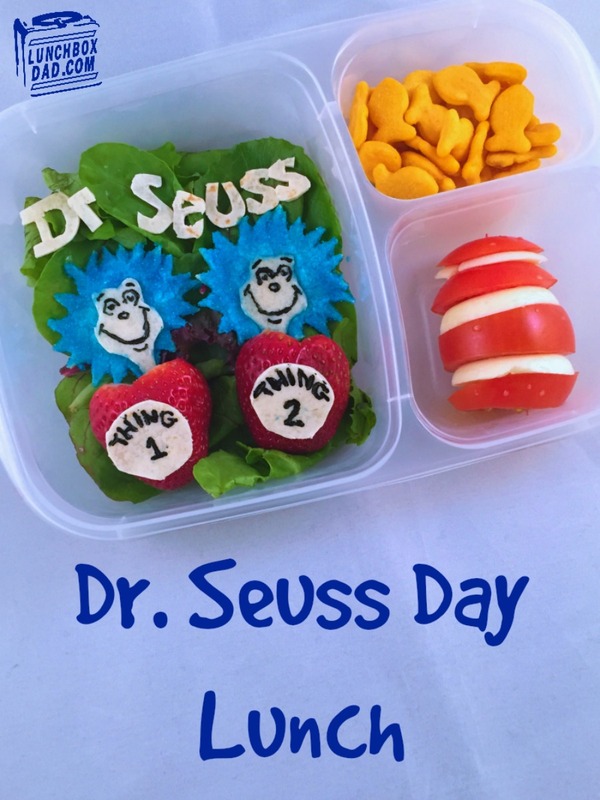 It's Dr. Seuss Day and in honor of this awesome day I made my daughter a lunch to celebrate. I'll be honest. We were gone all weekend on a long but fun work trip. I will tell you more about that soon. It might be the coolest thing my family has been able to do because of this blog. Definitely an unforgettable time! However, because of that trip we are pretty exhausted. So I will tell you what I put in the lunch but will skip the directions for today. My daughter is celebrating today with a pajama day at school and various Dr. Seuss activities though so I couldn't skip this lunch. If you want to know about some specific part of it, ask me in the questions below. I made this lunch in an Easy Lunch Boxes container. 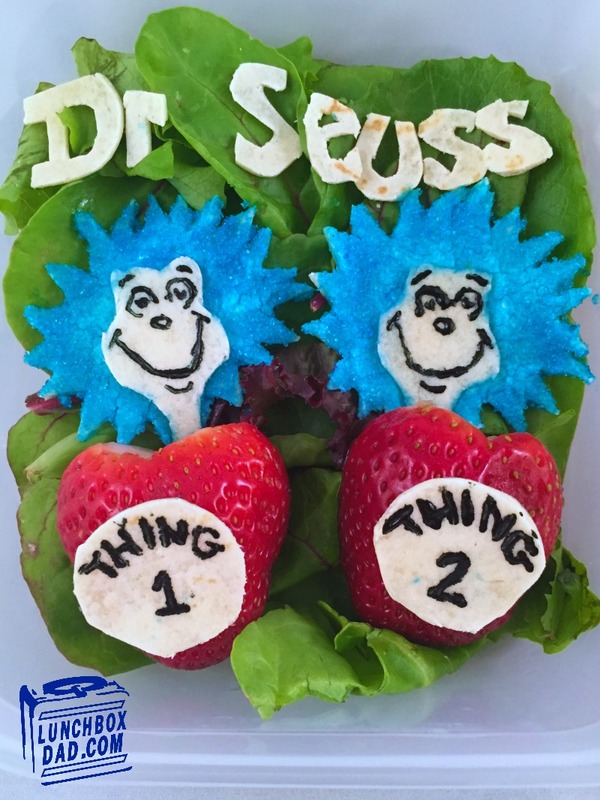 I made Thing 1 and Thing 2 with tortilla pieces. I spread cream cheese on the hair and put some blue sprinkles on top. The shirts are strawberries and tortilla pieces (glues on with a dab of cream cheese). The title is tortilla as well. I made the facial features with black food coloring and a toothpick. I went the simple route with the rest. I did a Cat in the Hat kabob with tomato and mozzarella cheese. The lunch is finished off with Goldfish crackers to represent that goldfish that always tried to keep the kids on the straight and narrow path. I hope you have fun with your kids today and spend some extra time reading some Dr. Seuss with them! If you don't have any Dr. Seuss still spend that time with a good book. It's one of my favorite parts of the day with my kids!